At the annual banquet in June each year, we read the list of the current year's passings and paused for a moment of remembrance for them. Sadly, it appears that 2016 may have been the last time we meet at a banquet. As time goes by, we lose more and more alumni. We make every attempt to keep of list of those who have passed from this life, but we are not always informed. If you know of a Carmel High School alum who has passed away, you may now notify us through this website. We make every attempt to keep our lists current and not omit anyone. Simply fill out and submit the form on the tab above marked "Report a Passing". Please give us the name of the person who passed and year they graduated from Carmel in the text of your message. We ask for your email address just in case we have any questions. Thank you for caring enough to share your loss with other alumni. Paul W. Gerhardt, age 30, passed away on April 1st. 2019. He was a 2007 graduate of CHS; a member of the Rugby team and photographer for the Hi-Lite newspaper. Jay E. Meimberg, 57, passed away on March 27th, 2019. He was a graduate of the class of 1980 and a veteran of the US Navy and a career fireman for the Indianapolis FD. Michael Craig Wood passed away on March 22nd. He was a 1978 CHS graduate. Debbie Castor, class of 1965, passed away on March 7th. A celebration of life will be held at a later date. Rick Daubenspeck, class of 1965, passed away in his sleep last night January 16, 2019. Carol (Stone) King, CHS class of 1959, passed away on January 9, 2019. Ron Nickel, Class of 1964 passed away on January 9, 2019. No other info is available at this time. Larry Beswick, CHS class of 1960 passed away on January 8th, in his home presumably of a heart attack. David Wayne Osborn, 45, of Noblesville passed away on Wednesday January 2nd. He was a 1994 graduate of CHS. Barbara Huffman Ritchey passed away suddenly on December 18, 2018. Lester "Muttie" Fleener, CHS class of '53 Passed on December 11th. Larry Isley, class of '62, has passed. More info to follow. Doug A. Rafferty, CHS class of 1970 has passed away on Oct 30, 2018. Janet Long Sherer CHS class of 1959, passed away earlier this year. Joe Newby CHS class of 1960, passed away on Saturday Oct. 6th after losing his battle with cancer. Cheryl (Cherrie Sue Leonard) Kochel-Binegar, CHS class of 1967, passed away on Oct 6th as a result of complications from cancer. Silas H. Burgher Jr passed away on Aug 10, 2018. He was a 1954 CHS graduate. Just notified that Matt Gulley - Class of 1981 passed on August 5th. Jack R. Klepfer passed away May 29,2018. Jack was 92 years old and graduated from Carmel High School in 1943. 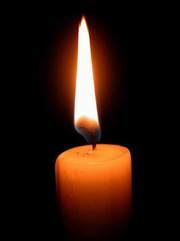 Rebecca Ann Baliff, 75, Carmel, passed away on June 13, 2018. She was a 1960 graduate of CHS. Don Harold Daubenspeck, 73, Atlanta, passed away May 29, 2018. He was a 1962 graduate of CHS. Mike "Silky" Sullivan passed away on April 14th, 2018. He was a 1967 graduate of CHS. Charles "Jeff" Rouse, age 62, of Naples, Florida passed away on Wednesday April 11, 2018. ​ He was a 1973 graduate. Notice has been given that Bob Jennings, a member of the class of 1965 passed in his sleep on March 21, 2018. If anyone has any information regarding surviving family members please notify us. FDNY Fire Marshal Christopher "Tripp" Zanetis, a 1999 CHS graduate died March 18, 2018 in a helicopter crash in Iraq.